Arroz con pollo (pronounced "Aros con POHyoh"--emphasizing the "A") or chicken with rice is a popular dish throughout Spanish-speaking nations. Although claimed to be a dish native to the Caribbean or Latin America, this dish has roots in the motherland of Spain. Arroz con pollo dates back to the eighth century when the Moors occupied Spain and influenced the way they imported and exported goods, along with the way they ate. The Moors invaded Spain in 711 and for over 700 years had an influential hand in all aspects of life--even cuisine. The Moors had a particular focus on the southernmost region of Spain near the Strait of Gibraltar and Andalusia, since in this location the Moors had access to the coast (a port for the exchange of goods) and Northern Africa (from where unique spices were imported). Moorish cuisine has distinct characteristics which reveals evidence that arroz con pollo originated in Spain during their reign. The cuisine is typically communal which means that dishes are shared and passed around the table. Arroz con pollo or paella would be passed around in a pot, served family style. The use of herbs, such as saffron, cumin and coriander, is also highly characteristic of the Moorish culture in Spain and these herbs are used in arroz con pollo. 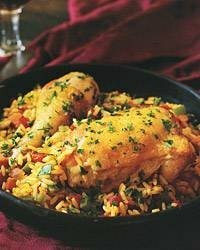 Color is another feature in Moorish dishes that suggests that arroz con pollo comes from the Moorish influence in Spain. The rice or arroz is colored reddish yellow due to the use of saffron. Moorish dishes also use a lot of green, yellow and white products, such as white rice with vegetables---another characteristic of arroz con pollo. All of those factors show evidence of the Moorish influence in this Spanish dish. The Moors introduced architecture and technology to southern Spain and also introduced a first class irrigation system to what was known as a culturally-vibrant region. With the introduction of irrigation and a functioning water system came the creation of cooked rice--a staple in almost every Spanish dish. Just as ideas, technology, products and people were brought over to the New World colonies, cuisine was also transported. Arroz con pollo, along with Christianity and language (Spanish in this case) was exported. Arroz con pollo has become a well known Latin American dish with particular popularity in Cuba, Puerto Rico and Colombia. All countries have a variation of this dish, using different spices, herbs and vegetables. There is evidence, however, that this dish is from Andalusia and was influenced by the Moorish culture. Where Did Eucalyptus Trees Originally Come From?